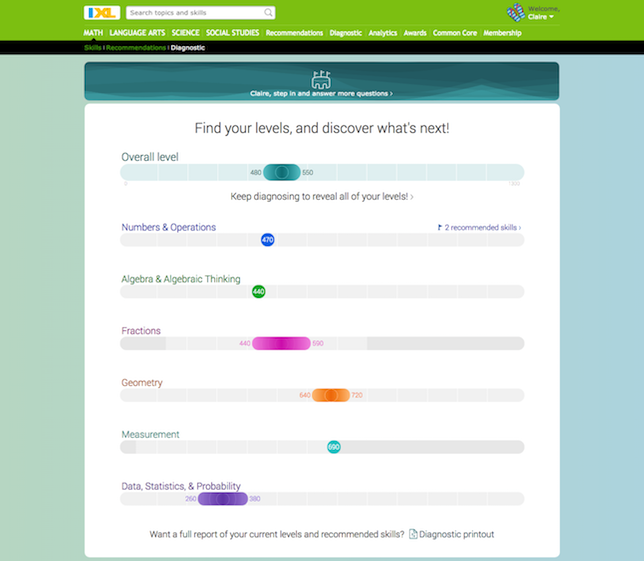 A new adaptive diagnostic for math has been added to IXL, a personalized learning program from IXL Learning used by one in nine students in the United States. IXL offers comprehensive, standards-aligned content for math, language arts, science and social studies. To date, students around the world have answered more than 30 billion assessment questions developed by educators, researchers and technologists on the program, according to the company. Furthermore, IXL works to adapt questions as student learn in an effort to help them master new concepts at their own pace and build confidence. The Diagnostic Overview (above) provides teachers with a snapshot of their students' knowledge levels. Image: IXL Learning. For the launch, the IXL Diagnostic is only available for IXL Math. It is designed to evaluate students on six key strands — Numbers & Operations, Algebra & Algebraic Thinking, Fractions, Geometry, Measurement, and Data, Statistics & Probability — as well as their overall working grade level. Students can access the diagnostic at any time and periodically choose which questions they want to answer next. They receive notifications whenever the program updates their knowledge levels or generates new recommendations. 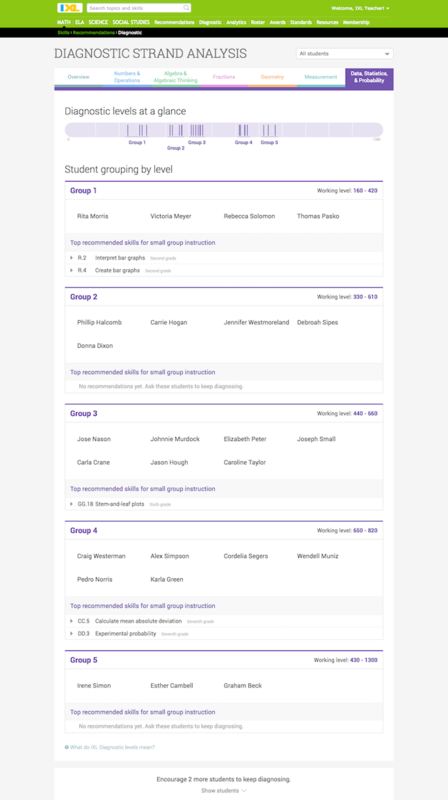 The Diagnostic Strand Analysis (above) lets teachers arrange students into groups based on their knowledge levels. Image: IXL Learning. Students and teachers gain a dashboard called the Diagnostic Overview that displays individual student progress. Teachers also have access to the Diagnostic Strand Analysis for small group-instruction to arrange students into groups based on their mastery-level. “The IXL Diagnostic provides a far clearer and more insightful portrait of students’ knowledge than any other test I’m aware of," said Paul Mishkin, CEO of IXL Learning. "And it does so in a way that’s a joy for students to use and even builds their confidence." Further information is available on the IXL Learning site.